Garden ponds with or without fish can be a great feature in the Sydney garden. A simple pond with some waterlilies is a start, you can even become more adventurous and include fish, water plants a bridge and even a water fall. 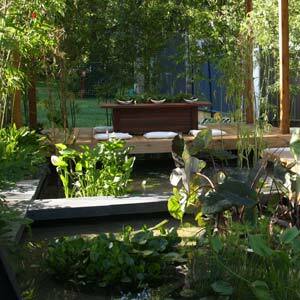 Or you might like to incorporate a pond into your outdoor living area. Without doubt water adds a soothing effect in the garden and with the right pond supplies you will find that garden ponds are relatively easy to maintain and add an extra dimension to your home landscape. A professional landscaper is one way to achieve the desired effect, however with preformed ponds in a range of sizes now available you can easily create a small DIY pond in your own backyard. Pond liners are one of the easiest methods of building a fish pond, the flexible butyle rubber is easy to install. Fish ponds are popular, and provide life to a garden pond. With the right selection of oxygenating plants, and a pond of the right depth they are easily achievable. Online suppliers can provide just about everything you need for a fish pond or water garden in Sydney, including water plants, pond liners and fish. A one stop shop to create a water feature of any shape and size. We stock ponds, pond liners, pumps, fish aquatic plants, ornaments and more. Hozelock, Cyprio and Resun King Pond Pump specialists. Express shipping Australia wide. Complete range of Firestone, EPDM all available to order online. Waterlilies, water iris, lotus, aquatic plants, fish, pond liners, ponds, water bowls,pumps 7 statues. Send 3 stamps for catalogue.